1 photograph : b&w ; 12 x 16 in. Item is a composite photograph of the Dalhousie University Faculty of Law class of 1934. The photograph consists of portraits of J. A. Walker; J. Willis; S. E. Smith (Dean); C. W. Stanley (President); C. J. Burchell; G. H. Crouse; H. E. Read; J. W. Godfrey; J. E. Rutledge; C. F. Longley; R. A. Squires; V. C. MacDonald; M. Ritaeff; F. H. Jones; W. F. Carroll; J. I. Dubinsk; D. J. Fraser; H. F. Muggah; M. Greenberg; J. 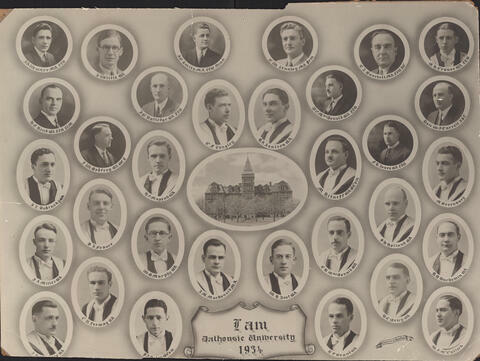 A. Miller; W. B. Murphy; J. M. MacDonald; W. H. Jost; C. R. Lormay; C. R. MacDonald; D. H. Holland; R. D. Duchemin; W. F. McCullock; H. C. Oxley; and H. F. Grant arranged around a photograph of the Forrest Building. Edges of photograph have been cut irregularly. There are tears in the left and top edges of the photograph. Matboard is worn around the corners and edges.